Images on this site are for viewing purposes only. Use of these images by any news media is forbidden. very beatuiful ! Thank sharing your pics. waitting for more. It is the pride of human. since STS-1 i have seen at least twenty launches and from up close and afar and i will always excite me beyond word. great pics. thanks for helping to keep the dream alive! i seen the shuttle launches, they are awsome, i luv the shuttles they are r my fav. , but i also like the deltas...their sweet!! Thanks for sharing an inside peek! Really wonderful shots! Thank you for showing how this is done! Excellent Gallery! Wow! What a collection! THANKS for showing the inside look at NASA and document these amazing feats. Better than watching birds at the Farm... Keep up the great shots! Amazing photos!! My Dad would have been proud, as he worked on the STS programs, TDRSS Team, 13 missions of the shuttle and the Saturn 5 rocket systems that went to the moon. These are to you Dad. Awesome. Spent an hour with my 4 year-old in this album. The most sensational little collection of Space Shuttle pictures I have ever seen. Thank you ,most impressive pictures, makes me proud to be an american all over again. It was a fantastic flight. Fantastic stuff, as I mentioned on the guestbook. I shoot launches too, www.LaunchPhotography.com. Awesome photo's! Thank you for sharing them. Wow is all I can say....................wonderful captures and thank you for the tour. Do you work for NASA? I have been to KSC several times and have never gotten closer than a half mile to the VAB. Those are some amazing photos! I always wondered what it looked like inside! I hope someday to see another Saturn 5 (or similar) rocket come out of that building for another trip to the moon. These pic.s really tell it. The angles and shots are, in some instances, better than being there! Great photos, It is a story line. Thanks for your efforts to let us being so close to the envent. Thanks for showing us something new! We didn't see the shuttle that was a pitty. love them, have tried to see launches with my dis, no luck! voted! I used to work for the Delta department at McDonnell Douglas/Boeing. I knew how powerful the Delta 4 was in numbers (thrust) - but the visual is almost shocking - that thing can really liftoff. I'm pleased that all the rocket motors lit. Can you imagine only 1 or 2 lighting unequally??? Too bad the costs will probably ruin the entire Delta series, especially once it becomes one with ULA. I'm open to learning more if anyone has info. Fantastic gallery, thanks for posting these. Truly incredible photographs of the shuttle returning to flight. I am telling everyone I know about your amazing pictures. Thank you for sharing them with us. excellent pictures of the 747 and Discovery. Looks as if you up in the air as well. Super galery! you can be very proud of these excellent pictures. Thanks for sharing them. Excellent gallery. Thank you so much for sharing your wonderful images. I've always dreamed of having the kind of access to a launch that you've had. Voted. Wow! This is awesome better shots than you find on space.com and NASA's own web pages. This gallery is amazing!!! Just incredible pictures! Thanks so much for sharing. Wonderful, wonderful images. Thanks for sharing. Stunning photographs! Thanks for your efforts and sharing them. These were sent to me by a friend. AWESOME! Kudos to a very talented cameraman. Wow. Thank you - almost as good as being there! Beautiful shots - I will share this site so others can enjoy. Thanks for such great photos. Certainly appreciated. Awesome shots Rod. Thanks for posting them. Hi Rod - Your friend GWolfe sent me your link. This are great pictures - colors are great & pictures are clear. Iam at NASAA in Houston. Hip-Hip Hooray for the STS114 liftoff pictures. These are stunning, both technically and emotionally. Please keep them coming, particularly for STS-114! I really appreicate this gallery after visiting NASA this past weekend. Got a chance to see the Comet Blaster launch and took a few photo's to post later. Great photography, thanks for sharing. Thanks Nick, We generally monitor different sources for the count down depending on our location. 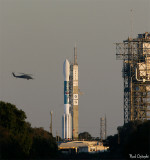 I'm going to purchase one of those portable band radios so I can shoot remotely and be able to monitor mission control. Really cool gallery, Rod. How do you know when they're about to take off? Too cool Rod. I'm totally jealous! Awesome shots, you must've been sooooo close. Thanks for sharing them. 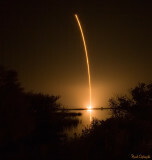 Very nice pictures of the rocket launch.